This is my version of a power grid for the LS17 Tractors Since there are some grids, but they have not liked me all, I created a separate one. All buttons and graphics were created and labeled. When a key is pressed, it lights up orange. Here are some functions for a better overview Color-separated. 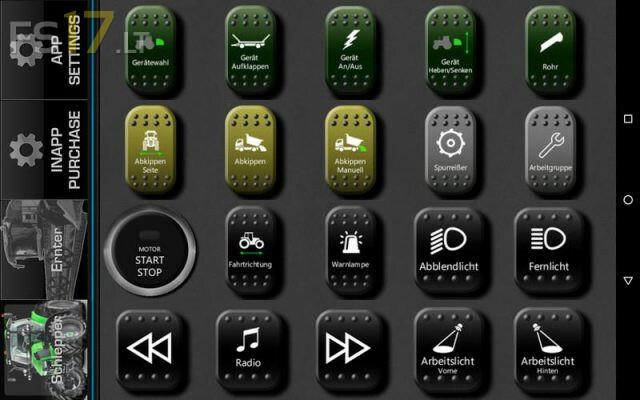 The main functions for operation have received a larger button. All buttons produce a click sound as acoustic feedback. Exception are the light buttons, as these in the game itself a click sound. The grid is for the PANORAMA VIEW. The device should therefore be able to be rotated by 90 °. What is a Power Grid at all? The power grid is a profile / skin for the ROCCAT Power Grid program. With this free software you can use an Android tablet or smartphone as a "remote" for computer games. To do this, you install the PC software on the computer, where the LS17 runs and also on the tablet / smartphone is installed a suitable app. After you have created a free account with ROCCAT, the profile can be activated and the software can be linked to the tablet. Now the tablet / smartphone serves as a kind of remote control. You can now control vehicle functions via the tablet in the game on the PC and thus graphically represent. You first need an Android smartphone or tablet. Next, you need the ROCCAT PowerGrid software, which is available for free on the manufacturer's website. Since I do not know if the link is allowed here, google just go to Roccat Power Grid and you will find it. On the tablet you can find the software on the Google Play Store under the name "Power Grid". Both devices must be on the same network, since the connection takes place via WLAN. You can find more detailed instructions on the pages of Roccat. I have now installed the software, how do I start the grid? If the software is now installed on both devices and ready, the grid can be imported. Just unzip this and simply double-click the .rpgp file. A window opens in the grid software. In the middle column the grid has to be marked with a checkmark, so that it can be imported. On the right side you find some information about the grid and the version etc. Then click on Import below. NUn can be selected from the list. It should also be located in the tab bar at the bottom right of the PowerGrid main window. Now you only have to click Apply and the grid is activated and should then be displayed on the tablet / smartphone. My grid is now running but some buttons do not go? This can be due to the fact that the grid software sends a key command to the PC, which then executes it. So here is not somehow the game directly controlled, only one push-button command is sent. If you have changed the standard key assignments in your game or even deleted them, the Grid will not work in its default state and you have to adapt it to your own requirements. To do this, select the button you would like to occupy in the grid software. Then go to the "Editor" tab at the top. NUn you can edit the button in the middle column and assign it a new function or a new key command. Go to the drop-down menu next to the "Function" entry and select "Assign shortcut". In the small window you can now open a button or a combination according to your wishes. This must of course correspond to the key combination of the LS17. If you have set the key combination Ctrl + H for your helpers, this combination must also be entered in Power-Grid. Then click OK and then click Apply again. The button is already occupied according to your wishes. I want to use more than one grid, is that possible? Yes, this is possible, but limited to 2 grids. Each additional grid must be purchased through an in-app purchase in the Android app. Each additional grid costs you a unique 89 cents. Once you have imported a second grid, you can place it on the right side of the tab bar. In the Adroid app, this can then be activated at the upper edge of the screen or at the left edge in the cross-section and can be changed quickly from profile to profile. For example, you can switch from a harvesting grid to a tractor or harvester grid.